This post is my contribution to UMW’s Digital Scholarship Institute discussions. I should start by confessing that I originally proposed four different ideas to talk about for my week: a nascent digital project on a poisoning case in a mental institution with Pinkerton detectives, as well as my courses on Digital History, the History of the Information Age, and this course, Century America. Mary Kayler wisely advised me to pick just one, and so I chose Century America as the best combination of unique approach and sufficient work done to have something to talk about. 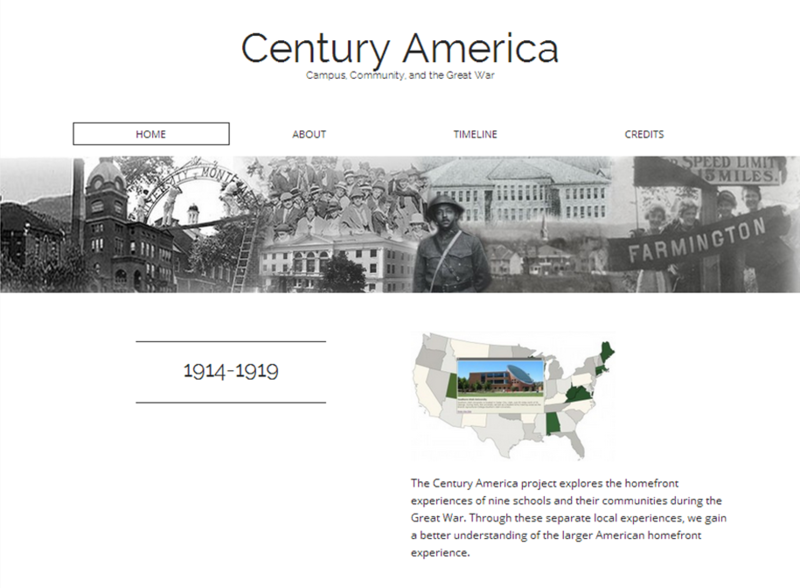 “Century America,” launched by the Council of Public Liberal Arts Colleges, is a digital-humanities project in which undergraduates on nearly a dozen campuses will produce a website documenting daily life during World War I. The project combines the virtual and the local—engaging students in exploring and mastering digital tools and resources while delving into the histories of their own campuses and communities. By semester’s end, the undergraduate researchers will produce a web-published product that will provide narrative and photographic overviews of campus and community life during World War I. The project will also document the impact of the global influenza epidemic of 1918-19 on those communities. This final product, accessible online, will make contributions to historical understanding locally and nationally. Using distance technology, student researchers on the 11 campuses will collaborate with one another and be guided by academic mentors—Ellen Holmes Pearson, an associate professor of history at the University of North Carolina at Asheville, and Jeffrey McClurken, chair and a professor of history and American studies at the University of Mary Washington. Students enrolled in the online seminar will blog about their progress, learn to create digital maps, integrate timelines into their work, and practice digital presentation. That approach to collaborative learning blends the traditional benefits of a liberal-arts classroom, high-impact undergraduate research, online teaching of digital skills, and the technical proficiency necessary for historians in the digital age. The “Century America” program receives generous support from the Teagle Foundation of New York. The ultimate goal is to have each student create a site about their own school and that school’s community’s experiences during the Great War and the Influenza epidemic that follows, but within a framework of a larger overarching site (built by the four UMW students who are part of the class). As you can see from this introduction and from the syllabus (which will give you a good sense of the structure and the assignments), this is an unusual course. Some have called this a “distance mentoring course,” but I like to think of it as a small, private, online course (especially to contrast it with the Massively Open Online Course). It is being taught by faculty from two different schools, and with students from nine different public liberal arts colleges. [We began with 14 students from 11 schools, but two students had to drop out because of other commitments.] It takes advantage of various distance-learning technologies/systems (Skype, Bluejeans, Cisco Movi-Jabber, and MCNC) to enable students in three time zones to have the same kind of powerful interactions with faculty and with each other that UMW and other liberal arts institutions pride themselves on. Most online course are larger and/or asynchronous. We meet together as a group in real time, 1-2 times each week, even as we are spread across the country. I’m not aware of any other course that brings together students from so many different schools to create a digital project together, especially one that provides both support and autonomy to build those projects. In terms of opportunities for the students, they have access to the expertise of two faculty members not at their institution, as well as many other resources from the various schools (including help from UMW’s DTLT), they have a chance to be part of a project that weaves together nine different local histories of schools and communities during the Great War with an overarching national narrative. They have the chance to see those different community histories through the eyes of people who are deeply interested in those communities because they are a part of the modern version of that community. The distance learning aspect represents the biggest change for me, having never taught online before. In some ways it’s more challenging than face-to-face classes: the video-conferencing technology isn’t perfect and it’s not easy for multiple people to talk without some pauses. It’s challenging in that it’s hard to read body language or to see people getting ready to talk or any number of cues that can be easily recognized by experienced teachers in the classroom. It’s also more challenging because the casual conversations that we typically engage in as faculty before and after classes simply aren’t there. So, getting to know the students as people is more difficult. Still, Ellen Holmes Pearson and I have worked to engage with students on their blogs and via Twitter (the class hashtag in #HIST1914). Dealing with students at different schools also has raised other issues, including differing student expectations, differing tech support levels, and differing research environments. We’ve tried to address those with clear guidelines, assignments aimed at building tech skills, support from the UMW students in the course (building on the concept of tech mentors), and lots of discussions about archival research, citation, copyright permissions, and many other topics that you can read about in the syllabus. The finished drafts of the projects are due April 3 and they look like they are going to be phenomenal. [See links off of here to check them out.] I believe that they will serve as a resource for some time to come for the public to use. How can we replicate this process without the resources of hire-behinds and/or a technical infrastructure for videoconferencing? What lessons can be learned from this for hybrid or face-to-face courses? I’m interested to know, if you could frame it more as an asynchronous course that didn’t depend on the technical infrastructure of video conferencing, would you? You mention some difficulties that I think are inherent in pretty much any platform (I’m reminded of this hilarious video) but as someone who has struggled myself in the lack of interaction in online courses I can certainly image there’s also real value to the video conferences. I’ve also seen cases where students have a real expectation that an online course be asynchronous since their motivation to take a course online is typically grounded in the need for a flexible schedule. Did you get any pushback as a result of that?